Today we commemorate the Holy Equal-to-the-Apostles Great Prince Vladimir (in holy baptism Basil), Enlightener of the Russian Land. 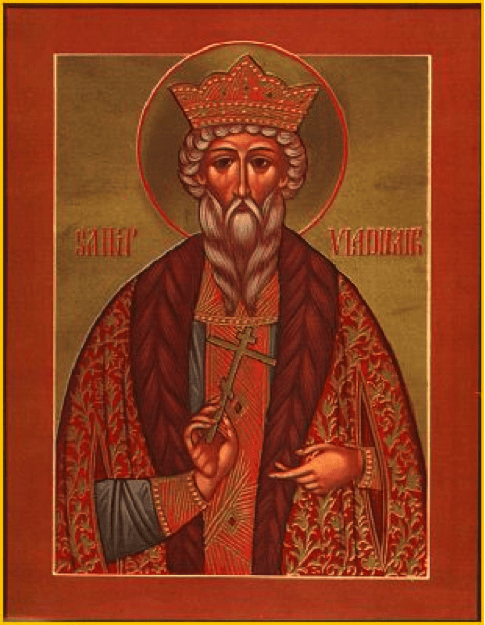 Vladimir was the son of Prince Svyatoslav, and grandson of Igor and Olga, and was at first completely pagan in faith and life. Learning of the existence of various faiths, he began to examine them, to decide which was best. He therefore sent envoys to Constantinople. When they returned, they told the Prince that they had been at a service in the Orthodox Church of St Sophia, and that they had been ‘out of ourselves, not knowing if we were on earth or in heaven’. This inspired Vladimir to be baptized, receiving the name Vasilii, and to baptize his people. The chief idol, Perun, was dragged off the hill of Kiev and thrown into the Dnieper. 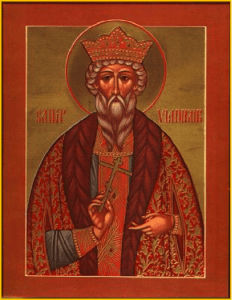 Embracing the Christian faith, Vladimir utterly changed his way of life and devoted all his labor to the perfect fulfilling of the demands of his faith. He decreed that churches be built throughout the land on the places where the idols had been pulled down, and himself built a beautiful church in Kiev to the most holy Mother of God. This church was built on the selfsame spot where St Theodore and his son John suffered martyrdom for Christ (see July 12th). With the same irresistible force with which Vladimir earlier upheld idolatry, he now spread Christianity. He entered into rest in the Lord in 1015. Fathers, Tone 8: MOST GLORIOUS ARE YOU, O CHRIST OUR GOD! YOU HAVE ESTABLISHED THE HOLY FATHERS AS LIGHTS ON THE EARTH! THROUGH THEM YOU HAVE GUIDED US TO THE TRUE FAITH!// O GREATLY COMPASSIONATE ONE, GLORY TO YOU! Fathers, Tone 8: THE APOSTLES’ PREACHING AND THE FATHERS’ DOCTRINES HAVE ESTABLISHED ONE FAITH FOR THE CHURCH. ADORNED WITH THE ROBE OF TRUTH, WOVEN FROM HEAVENLY THEOLOGY,// IT DEFINES AND GLORIFIES THE GREAT MYSTERY OF PIETY! Saint, Tone 8: MOST GLORIOUS VLADIMIR. IN YOUR OLD AGE YOU IMITATED THE GREAT APOSTLE PAUL: HE ABANDONED THE THINGS OF A CHILD, WHILE YOU FORSOOK THE IDOLATRY OF YOUR YOUTH. TOGETHER WITH HIM YOU REACHED THE FULLNESS OF DIVINE WISDOM: YOU WERE ADORNED WITH THE PURITY OF HOLY BAPTISM; NOW AS YOU STAND BEFORE CHRIST OUR SAVIOR,// PRAY THAT ALL ORTHODOX CHRISTIANS MAY BE SAVED! Epistles: Romans 12: 6-14, Hebrews 13: 7-16 (Fathers), and Galatians 1: 11-19 (Saint Vladimir). Gospels: Matthew 9:1-8, John 17:1-13 (Fathers) and John 10:1-9 (Saint Vladimir). ➢ For the next several weeks, the parish will be accepting donations to give to the Magdalene Home, a resource for homeless pregnant and parenting teens. Now that we are back to a regular schedule of Liturgy, please sign up for coffee fellowship/kitchen cleanup. Parish council meeting will take place today (July 15th), following the fellowship meal. Thank you all who contributed to our Patronal Feast last Thursday night!